I could say oops, Chris Rempel did it again. The “it” I’m talking about is a new VIP Confessions report : The Visitor Value Multiplier. Allow me to call it VVMM. At first you could think that multiplying your visitor value is about selling more than once, offering backend sales or building a list to send them more offers. Well, it’s not that, as list building already has been mentioned in his previous reports. It’s actually easier than that. The report tells you how to multiply any site’s earning with simple tweaks. I love Chris Rempel’s stuff, really. First’, it’s always cheap and always delivers. There are always some great ideas that you have never read or heard before. I already talked about his material (see the post Chris Rempel – Vip Confessions Reports by A Lazy Marketer). These previous releases taught you how to create easy websites with almost no work (Chris likes to work smarter, not harder). Short and very straight forward. The VIP Essential package was of an amazing value to me. It was made to implement the VIP Conduit Method even more easily than it already was : you got the high converting templates Chris uses to create these websites, you almost only have to fill in the blank. There is something Chris Rempel seems to be obesessed with, and that’s CONVERSION, which is not a bad thing. He always focused his message on conversion, so even with low traffic, the methods he reveals allow you to generate sales. In the VVMM, he pushes the conversion message further. 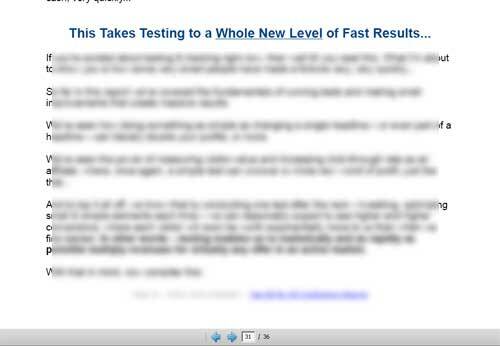 This VIP report is the longest one (36 pages), and it tells you everything you need to know toimprove your conversions. All the elements of your website or landing page that you can quickly modify and see if you are getting better results. Yes, it’s about testing and tweaking. 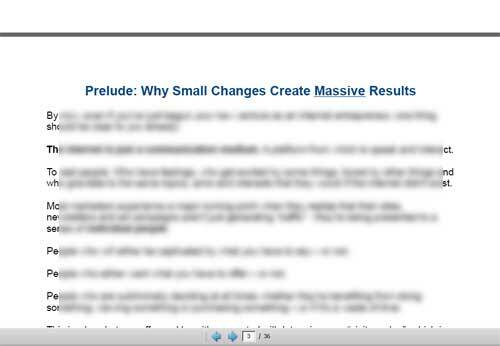 And as he says,it’s about numbers too : getting the highest conversion rate possible by scaling. Testing is not viewed as the funniest part of making money online, so Chris Rempel explains how and why it is essential. You can see live examples in the report and you may start to think that’s fun. In fact, VVMM shows you why conversion is more important than your traffic : because with the same level of traffic, if you can double, triple or more your sales by just adding a picture or changing your headline, it’s certainly worth taking the time to dive into split testing and some other things linke that. This is also the first time Chris talks about Pay Per Click. He generally is a fan of free traffic generation methods and organic rankings, but for the purpose of this report, PPC is the most appropriate, and the fastest way to get a high enough level of traffic that shows you reliable numbers. So PPC marketers are maybe the ones who will benefit the most of this report, although there is a chapter on running tests for affiliate sites and content sites. He gives you the free tools you need to get started. Yes, free tools that are enough to compare and optimize your results. Of course, this report is not the Bible on landing page optimization but it actually tells you from experience how to get a better converting website, the easy way, step by step and to push the conversions at the maximum, and that’s what we want. It’s not that hard actually, I’ve checked the tools and it’s worth using them. You need these tools to track your results and know what to improve. It’s a great report, and it follows the spirit of Chris Rempel material that is focused on conversion.Think “conversion optimization”. It’s priced at $14.95, again, it’s well worth it and even more. Chris is really a guy I trust now. When he produces something new, it’s always fresh. He always makes things easy for beginners but also give new tactics for advanced affiliates. At the end of the report, Chris shares a technique that puts all you just read at a higher level. He recommends that you get familiar with the conversion optimization process before you try this one. When I read it I thought “oh F*ck Yeah !”. As a smart working marketer, it’s about profiting of other’s work. I can’t tell much about it, but it’s ethical and legal, it’s not outsourcing either. 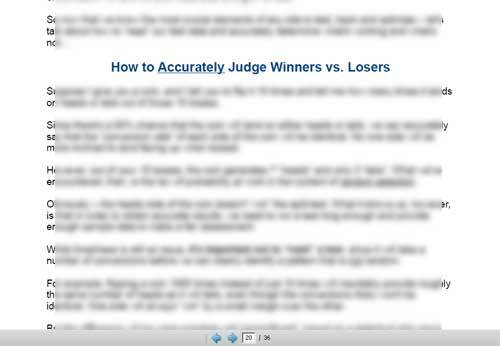 Just tweaks and you’re done. Chris Rempel again created something brilliant, an eye opener for many people. Do I recommend VVMM ? Of course I do ! 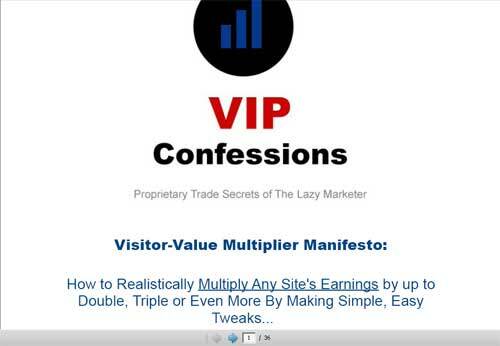 Check now the Chris Rempel VIP Confessions report The Visitor Value Multiplier Manifesto. This entry was posted in Affiliate Marketing, Internet Marketing, Make Money Online, Pay Per Click and Paid Advertising, Traffic by Tom. Bookmark the permalink. I like everything Chris Rempel writes – especially his Conduit Method report. 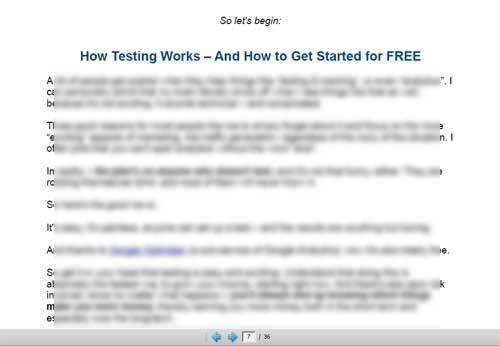 The value of testing can’t be overestimated. It’s so important. I admit I’ve been intimidated about in the past but with his new Visitor Value Multiplier I feel like I can finally do this successfully. Yeah, Chris! You’re da man. You’re right the conduit method is really so easy, fast and powerful. No doubt Visitor Value Manifesto adds some more value to it, with conversion in mind, which was already well laid out in the “VIP Essentials Layout That Sell”.